Santa Cruz Hightower C S+ Review — The Brighter Cyclist. FEATURES: 135mm rear travel Rock Shox Monarch RT, 150mm Rock Shox RC Pikes, 2.8 inch Maxxis tyres, WTB i45 Scraper rims with Hope Pro4 hubs, Race Face finishing kit. LOWLIGHTS: Delicate Maxxis side walls, Lack of front triangle space for larger water bottles. When RutlandCycling got in touch and asked if I would like to review the latest Santa Cruz Hightower. I of course, didn't waste any time in taking them up on the offer. I was keen to test out the latest generation of plus tyred bikes that supposedly offered more traction on the trail. With Mountain Mayhem and Bike Park Wales booked in the diary it seemed like the perfect opportunity to put this theory to the test. So this is Santa Cruz's latest bike, the Hightower shares some strong DNA with the Bronson which is Santa Cruz's much loved aggressive trail / all mountain bike. The Hightower adds 29" wheels and 27.5" plus tyre compatibility into the mix to create a big-wheeled trail monster. The 29er "S" version shares the same frame as the 27.5" "S+" but with a few small differences the first being that the "S+" Rc Pikes have an extra 10mm of travel, the chip in the upper link is flipped to keep the head angle at a slack 67 degrees as well as maintaining the bottom bracket height, but the main difference between the S and S+ models are the wheels. The 27.5", 45mm wide WTB Scraper rims with wide 2.8" tyres have nearly the same rolling circumference as the 29" wheels which is why the same frame can take both wheels sizes. As well as offering two wheel sizes and several build specs there is also two frame options on offer, a more premium and lighter CC carbon frame or the 230g heavier C carbon frame. The bike I've tested is the heavier carbon C frame in S+ spec. Although the brakes on the S+ are Shimano's midrange SLX and the drive train is Sram's midrange GX both are reliable and got on with the job of shifting and stopping in a workman like fashion. The 150mm RC Pikes and Monarch RT rear shock are again tried and tested kit. Once setup to the recommended PSI and rebound set a few clicks slow of middle, I found they needed little to no tweaking and felt right straight out of the box. Race Face 35mm diameter 760mm wide turbine bar, 50mm short stem and Aeffect crank finish things off nicely. I was apprehensive because the first opportunity I had to really put this bike to the test was at Mountain Mayhem which is a fantastic 24hr bike race. Most participants are on XC bikes, some are even hacking about on rigid single speeds. But here I was with a tractor tyred aggressive trail bike. Conditions throughout the race were muddy and slick, but that's where the S+ came into its own. The traction on offer from the 2.8" Maxxis tyres really pulled me through even over rooted uphill sections that should have left me scrambling for grip. In fact, over all I was really impressed with how well it climb especially for a 150/135mm travel trail bike. 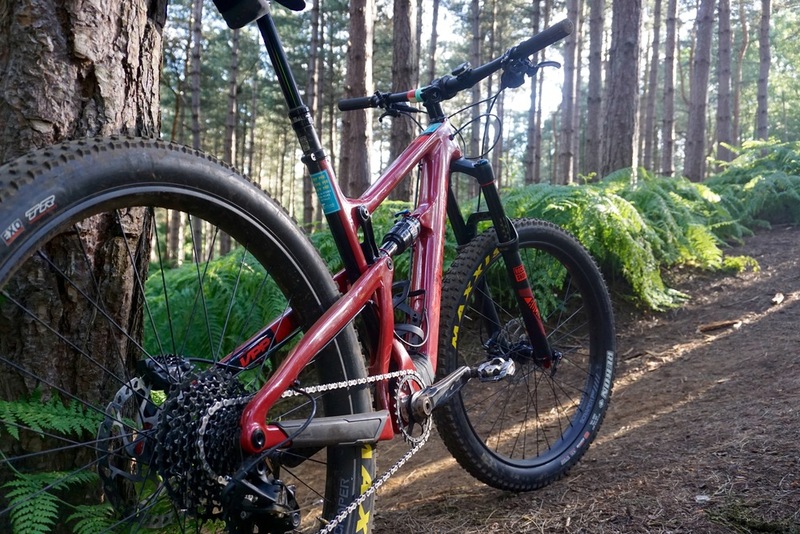 The Hightower S+ made equally light work of going down hill, slack 67 degree head angle, reasonably lengthy 448 reach and short 434mm chain stays all help to make the bike feel very stable and confident at speed yet still willing to pop into a manual at will. It Just encourages you to push on harder feeling safe in the knowledge that those grippy plus sized tyres won't let you down when you need it most. I left Mountain Mayhem on a bit of a high, not only because our mixed team of ten narrowly missed the 3rd spot but because the bike had really surprised me. Next up for the Hightower was Bike Park Wales, a fantastic fun magical place where vans take you up so that you can concentrate on going down. I've ridden BPW Many times so I knew the Hightower would be a giggle here and it didn't disappoint. Once again proving it's got grip in spades and a confident swagger. But it's not all sunshine and rainbows, I lined myself up to take on a drop off that has alluded me for some time. Feeling full of confidence I put in a few pedal strokes, screamed "I hate drop offs" and sent myself over the edge. Imagine my surprise when I not only landed it but torn through the side wall of the Maxxis Ikon. Unfortunately, that wasn't the only puncture of the day proving the rumours are true and plus tyres are sensitive to punctures. Riding it at BPW also brought another issue to the fore, it's a tight squeeze fitting a plus tyred bike on an uplift trailer and whilst on the subject of tyres it can take some tweaking to get the pressures right. I ran approximately 15psi in the front and 18 in the rear, you'll find too much and the tyres start to feel wooden too little and they become squishy. One other negative was the lack of frame space for a large drinks bottle, a small issue I know but as I like to ride without a pack I do prefer to carry a larger 750ml bottle. Then there's the price at £4000 it's not cheap but it is a Santa Cruz and the cost of ownership has always been on the pricey side. What I will say is that even though it is on the costly side I doubt you'll be disappointed if you bought one and that's a testament to just how much fun it is.